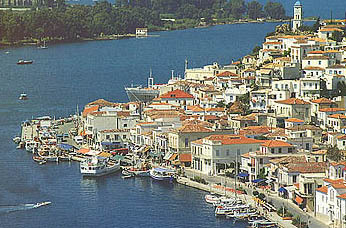 Poros is a nice green island with a population of about 3,500. There is a daily service, provided by both ferries, which do the trip in two and a half hours, and by hydrofoil (1 hour), from Piraeus, which is 31 nautical miles away. Aegina, Methana, Hydra, Spetses and Ermioni can be reached by the same means, while the "flying dolphins" (hydrofoils) also go to Porto Heli, Leonidi, Kyparissi, Monemvasia and Kythira, and in summer in Tolo and Nafplio.